When inspectors said thousands of care home residents were being given the wrong medication - the image of a grotty, poorly run nursing home reared its stereotypical head. How could something so simple as giving a patient their daily dose of tablets be going so wrong, so many times over? But according to care professionals, management of residents' medication is one of the most complex areas of running a nursing home. And unless fail-safe practices are adhered to, the results can be very damaging to both the resident and the care worker. Adrian Webb, who runs a specialist mental health unit for elderly mentally ill people in central Manchester, says the main problem is that there are so many people in the chain. An ordinary patient would take their GPs' prescription to the pharmacist and then, presumably, take the medication in the advised dose. Each stage of the process there is potential for error. In the case of a care or nursing home resident, there are so many more people inputting into the system. The prescription might be written by a GP or consultant. The pharmacist then has to make it up, then it will go to the staff in the home for storage and then a number of different people may be involved in the issuing the medication to patients. Mr Webb, who is a registered nurse and oversees the distribution of drugs in the Victoria Park Nursing Home, says: "At each stage of the process there is potential for error. "It has been known for prescriptions to come from doctors that are incorrect. "But it's very easy for someone to type 100 instead of 10, for example." In the Victoria Park Nursing Home, which he runs with his wife, he checks every prescription that arrives from the doctor and pharmacist for errors. And because he is a registered nurse, he has some knowledge of the kind of doses that ought to be expected and the drugs that are used. He recalls one instance of receiving a batch of drugs which came from the pharmacist in the wrong dose. The only way he knew it was incorrect was because he happened to know the higher dose pills were a different colour. Here, it was his nursing experience which allowed him to spot the error. But in a care home, where the administering of medicine is not carried out by a nurse, it is questionable whether a mistake such as that would have been noticed. "If you have not trained as a nurse are you really going to have the confidence to challenge the doctor or pharmacist about his prescription?," asks Mr Webb. He also says the fact that a nurse could potentially lose his or her job over a medication error tends to focus the mind. But Laura, a care assistant in the North West, who has worked in three homes for the elderly and one for people with learning disabilities over the past four years, says medication issues are taken extremely seriously indeed. She said she spent the majority of her breaks drinking her coffee in front of a poster detailing what to do if a drug error occurs. There are sheets for everybody coming into the home whether they are there for long or short term care and careful records of what medication is distributed, she says. "The team leader is responsible for handing out the medication. "There's a sign on the trolleys saying do not disturb while giving out medication and they are not disturbed," she said. As in Mr Webb's nursing home, Miss Bates says the person giving out medication is focussed on that job and is not allowed to run off and answer a phone, for example. But director of information at the Alzheimer's Society, Clive Evers argues the high turnover of staff and their limited training can been the odds are stacked against good practice. "The workforce is very under-resourced and under-recognised. There is very limited training of staff. "This is a workforce that would not be allowed to operate with children but they are allowed to work with adults in this way." With up to 70% of people in care homes suffering from some form dementia, one might expect staff to have training in how to deal with their symptoms. 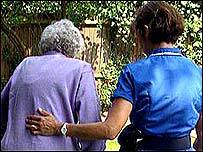 But guidelines have only recently been adopted by the watchdog, the Commission for Social Care Inspection. 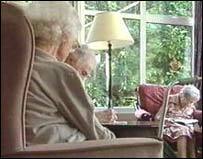 One of the other key worries in care homes is the over-use of anti-psychotic drugs and sedatives. Over-medication is something that Mr Webb fights against in his nursing home for elderly patients with challenging behaviour. Patients can take months to get over the heavy sedatives they are given during a visit to hospital, he says. Good working relationships with GPs and consultants however allows his staff a certain level of control over what the patient is given. "We give the minimum amount that is needed and it is reviewed regularly. "We favour as little medication as possible to allow people to be themselves. The more medication people are on - the more problems they have." But according to Mr Evers, not all homes have even this limited control over what their residents are prescribed. "Neuroleptics (drugs) are used to limit behaviour that the care workers are not trained to deal with. "It's using the so-called chemical cosh instead of more skilled techniques to look after someone. And unfortunately we know that this is still happening."